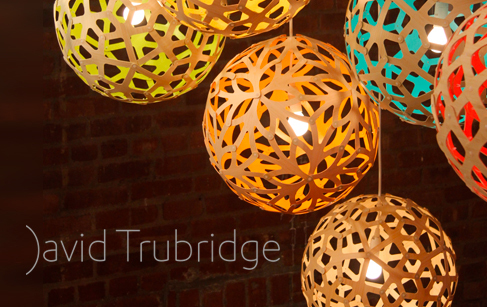 David Trubridge Ltd was formed in 1995 when David started to expand his operation from his small designer/maker business. The company is driven by a strong environmentally conscious philosophy which informs all aspects of design and production. Trubridge answered the fundamental question of why he designs: “To provide cultural nourishment, to tell stories, to reach people emotionally and spirituallyTrubridge has had a long-standing passion for the environment, deepened by his time at sea. In 2004 he was selected for the Antarctica Arts Fellowship program, which allowed him to spend several weeks in this remote and ecologically delicate location. It was an experience that inspired Trubridge to heighten his pursuit of environmental sensitivity, both as an individual, and as the driving force behind a company that continues to expand. This ethos is demonstrated in the company's dedication to sourcing sustainable materials. Wherever possible, all timber is from sustainably managed plantations in New Zealand, or the United States. Wood is left natural where appropriate, with natural non-toxic oils being used in place of harmful solvents. From a design point of view, the products use only the minimal amount of materials and are generated with a focus on longevity, rather than mimicking quick-moving trends. Shipping and freight is often reduced by the introduction of the Seed System. These come flat packed and ready for the customer to assemble. Larger, more complex kitsets are also shipped as flat packs, with distributors constructing them in preparation for the market. Environmental responsibility also extends to the day-to-day operations within the Trubridge headquarters. This includes recycling all factory and studio waste, using 100% hydroelectricity, and taking full responsibility for the entire process from design conception to shipping and freighting of the final product.